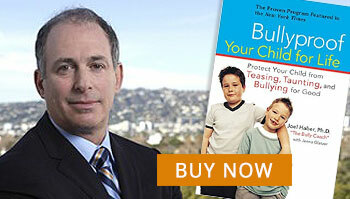 School Bullying Programs by Dr. Haber Help You Bully-Proof Your School and Your Students For Life! Bullying in Schools has been shown to contribute to poor student achievement, increased school avoidance and absenteeism, and even juvenile crime. Is bullying a problem at your school? The Respect U School Bullying Program is designed for elementary, middle and high school and is designed to help you manage bully problems for the entire school year. It’s been proven to dramatically reduce bullying and it helps create a culture for the prevention of bullying in the future. One time assemblies as a bully prevention strategy does not work. Consistency with bully prevention yields long-lasting results. Dr. Joel Haber, offers one-day or two day on-site programs that introduce all staff to important anti-bullying concepts and strategies that work. This training is designed for principals, teachers, support staff, community partners and parents. The program is customized for your specific school and focuses on school safety and bully prevention. For unique situations requiring special training and programs, the Bully Coach customizes a plan for the day-long consultation determined prior to the visit. Dr. Haber provides the help you need to tackle the tough problems in bully prevention that can overwhelm your resources. Learn where to focus your efforts and reduce bullying . I’ll show you how to maximize the time spent on bullying efforts without wasting valuable time in other places. A day-long program focusing on administrators, teachers, and other educational support staff. Two days of training with more intensive cyberbullying training designed to help administration, teachers and their students identify, manage, and help decrease bullying in the classroom and the school. Interventions build around ongoing faculty involvement with their students. Please contact us for details and pricing for this program. I offer crisis management services for administrators, parents, school counselors or a combination for a specific incident. These anti-bullying coaching services help you manage a bully concern by providing the right protocols and skills to manage or resolve a bully situation. Current consultations may involve conflict resolution from bullying concerns between parents/children and schools where differences exist between what constitutes effective bullying intervention. Please contact us for details and pricing for this program. There are times when specific coaching sessions are not enough to resolve more complicated issues. Dr. Haber is available to work with you and/or family based on the needs of your own situation. His parent coaching and anti-bully expertise has a long and distinguished record in overcoming difficult family dynamics or specific problem situations you may be experiencing. This may involve phone consultations or face to face meetings.